Note: In order to effectively review The Wolves of Andover, I have to discuss Kathleen Kent's incredible debut, The Heretic's Daughter. There wasn't any doubt I wanted to read Kathleen Kent's The Wolves of Andover since I loved her first book, The Heretic's Daughter, so much. I read and reviewed it and a few other books about Salem in this post here. 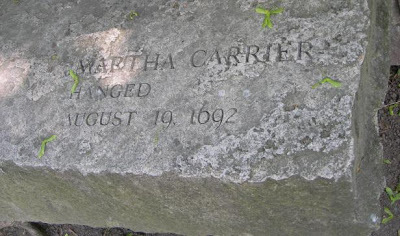 Part of my desire to read her first book, other than my own interest in the Salem Witch Trials, was because Kathleen Kent is a direct descendant on her mother's side of Martha Carrier, one of the nineteen victims who was hanged for being pronounced a witch. To some degree, most people are fascinated by this event. A few ill-placed rumors and frenzied actions created one of the most pervasive panics, resulting in innocent men, women, and children to live in deplorable conditions in the town jail, only to be executed because they would never agree that they were witches. The Heretic's Daughter is told through the young, strong voice of Sarah Carrier, their daughter, as her family deals with the accusations against Martha. Kept in a filthy cell for months, with only a bucket to share with other prisoners for a toilet, their final sentence of death is heart-wrenching to read. Kent's second book, The Wolves of Andover, takes place well before these fateful events. It's the story of how Martha and Thomas met and the relationship that ultimately secured their friendship and loyalty to each other. When Martha is nineteen-years-old, she goes to help tend the home while her cousin struggles in her final months of pregnancy. Thomas is a man living and working to save for his own plot of land by helping Martha's cousin and her husband on the farm. Initially a quiet existence, it is a peek into the world of 17th century America, the subtle but sweet courtship that occurs, and the secrets that are part of both Martha's and Thomas' pasts. Life during this time is just plain hard. Everything, everyone, could be untrustworthy - they could easily be a wolf to come prey upon your most intimate vulnerabilities. But this is also about Thomas and the rumors whirling about him. As a Welshman and member of the Royal Guard of the King of England when he was younger, he is rumored to be the executioner of Charles I, and there is a bounty on his head. The colonies are known to have kept quiet the whereabouts of those who contributed to the rebellion against the king, those who followed Oliver Cromwell on the battlefields. But will the town remain quiet when the four thugs who are hired in London make the dangerous journey across the Atlantic to hunt down Thomas? 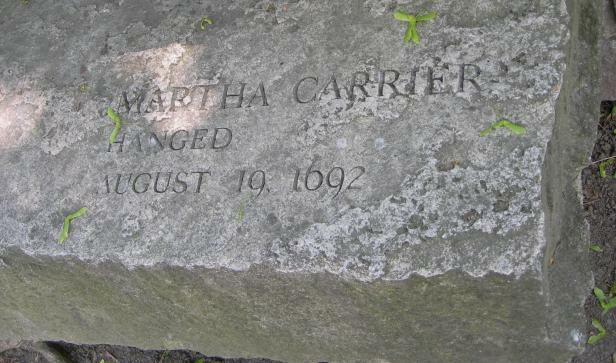 It's truly amazing how Martha and Thomas are significantly entrenched in two very distinct events in history - a King overthrown in one country, and the mass hysteria of the Salem Witch Trials in another. Part of the reason why I love Kathleen Kent's books so much is that her work is unbelievably polished. Her scenes are as pure and true to how one might write and read in the 17th century, without losing any sense of its "readability" in our modern times. Each scene smoothly transitions to the next. Character development is such a key strength with her work and while Martha's strength to fight back is documented in history, her famous words confidently spoken during her courtroom trial without fear, "You lie! I am wronged.... It is false and a shame for you to mind what these say, that are out of their wits!" it is the quiet, strong, and unbelievably tall and honorable Thomas who engaged my interest even more so in this book. 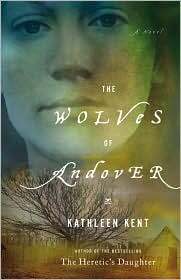 While The Heretic's Daughter introduced her to the world, The Wolves of Andover has unquestionably and firmly established Kathleen Kent as an expert author, one whose books should always be kept on your shelf. Read her work in the order it was published and intended: First, The Heretic's Daughter and then The Wolves of Andover. You know what is going to ultimately happen to these two noble and tough people in the early years, but they don't, and this is where it is so genuinely moving and tragic. Kathleen Kent has such a captivating way of bringing you directly into the heart of the tragedies, and for that I am extremely thankful to read her work, and I look forward to much, much more from her. If you're interested in the Salem Witch Trials, the people who were part of it, and their story of who they were before the trials, the humanity and the sadness of this terrible time, you should probably go get this book right away. 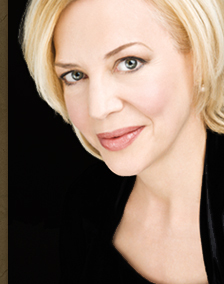 Kathleen Kent is a tenth-generation descendant of Martha Carrier. She is also a masterful storyteller, and in her first novel she paints a haunting portrait, not just of Puritan New England but also of one family's deep and abiding love in the face of fear and persecution. Kathleen also was honored to be awarded the David J. Langum, Sr. Prize in American Historical Fiction. Visit Kathleen Kent's website by clicking here. Visit Kathleen Kent on Facebook by clicking here. FTC Disclosure: Many thanks to Crazy Book Tours for providing me a copy to participate in this tour. I really want to read both of these books! Oh, to have more time for reading! thats werid as I have just finished reading The Heretic's Daughter and my review of that will go up in the next few days. I have to admit I wasn't expecting all that much but I ended up really enjoying it and I'm glad the author wasn't ready to leave Martha Carrier just yet! I really liked Heretic's Daughter and want to read this one as well. Thanks for sharing your thoughts. You've changed my mind. I have not really been into reading these books but now I'm adding them to my wish list. I have both of these books, and am anxious to make the time to read them. I love that you mention that they are so accessible, yet the writing has such historical flavor. I think it's interesting that both of the books deal with such significantly different events, but both have the power to catch their audiences attention and keep them captivated. Fabulous review, Natalie! Your prowess in writing style always impresses me. Wow, how could I not want to read these two books now? Thank you for sharing such an amazingly, heartfelt review! Sounds like two books and an author that I don't want to miss! Ok, definitely have to read this one! I'm reading a book now that tells the second half of the story before it tells the first half, which sounds like what these two books do, and I'm loving the format. I'm so glad I already have this one waiting for me on my shelves. Thanks for pointing out its greatness to me! GREAT! thanks! I haven't read The Heretics Daughter yet but am definitly getting off the shelf! I can't wait to read this book! I haven't read The Heretic's Daughter but have it on my wishlist. I really want to read both of these as well. They sound very interesting. Adding to my wishlist! I've seen an amazing poster for the Wolves of Andover at my local bookstore, and have mentally added it to my list. I'll pick up The Heretic's Daughter first now! Those books sound good. I got interested in the Salem Witch Trials after seeing Sarah Jessica Parker trace her ancestor on Who Do You Think You Are.